Shika in Marathi means 'to learn'. Shika is a Learning Management System (LMS) for Joomla. With Shika, our aim is to make teaching and learning online easy and intuitive. Though we are coming out with the public release of this product now, its been in continuous development over the last 3 years and is part of the production learning infrastructure of several of our clients. Building this application has been a learning experience for us as well and given us a chance to innovate. With inputs from teachers, corporate clients as well e-learning content development companies, we have structured Shika such that we can solve a variety of learning needs. We believe that listening to clients and working with them gives us much more insight and makes products stronger and more tuned to your needs. No orphans will be created after deleting a Course or a Lesson. Shika ensures systematic cleanup of the associated data after deletion. Admin can setup more customized ACL and grant access on a more granular level. Admin has the liberty to change the completion status of any attempt of any lesson / quiz and the score of any attempt of the quiz. And also the power to delete a lesson / quiz attempt. This way he can reset any attempt of any lesson / quiz of a user. Com_hierarchy lets you set context specific hierarchy relations between users which is further used to set training managers for users. Shika LMS integrates seamlessly with the beautiful Academia template from Themexpert that is a perfect fit for all educational purposes. Academia also offers 3 homepage variations and 20 built-in pages. The new TJ dashboard integration with Shika 1.3. A complete drill down for each enrolled user to the lesson level. With this feature we allow a Course owner to see reports of courses created by them. Shika 1.2 introduces support for com_hierarchy that allows for manager-employee relations. This has been used in TJ reports to provide the infrastructure for manager reports. Via this feature a user who has users reporting to them in the hierarchy system will be able to access reports for their reportees. 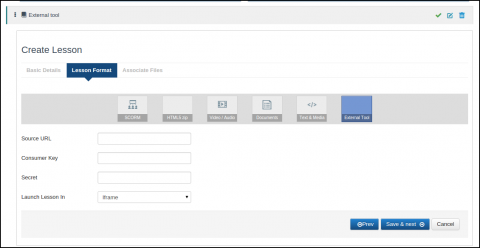 TJ Reports introduces the ability to set access on a per report basis. You can configure this in the report edit screen and choose which Joomla user groups have ‘View All’ access or have ‘View’ access. Administrators can be given view all access. This defaults to view which means you can view reports of items you own. If you are in a mood to explore and do further customisations to reports, TJ reports supports report configuration where you can customise what fields from the report superset load by default. You can do this using the Params section in the report configuration. We will be releasing detailed documentation on this soon. Between this feature and access control, you can create different versions of a single report for 2 different user groups. We understand that as a administrator you might not want to grant access to your backend to Managers & Course Authors. 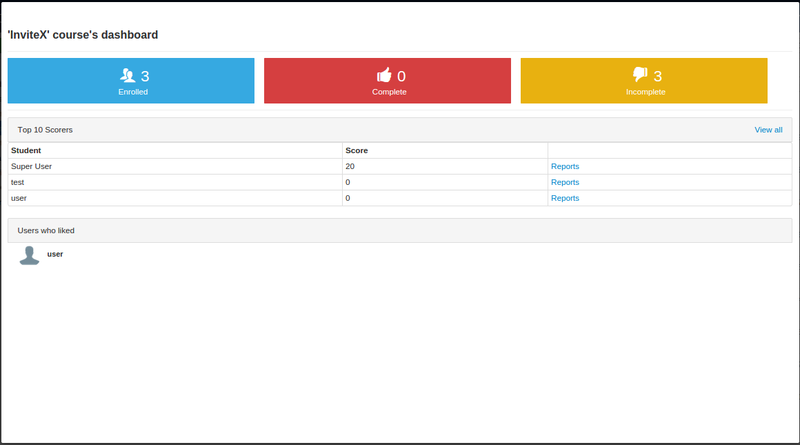 So we have allowed creating a menu to reports in the frontend. Depending on the logged in users access they will be shown the relevant reports. This makes it easy for us as well as 3PDs to extend the platform and introduce new lesson formats. Plus if you don't want to use any of the formats, you can simply disable the plugin. Added coverage for REST APIs for several system artefacts. 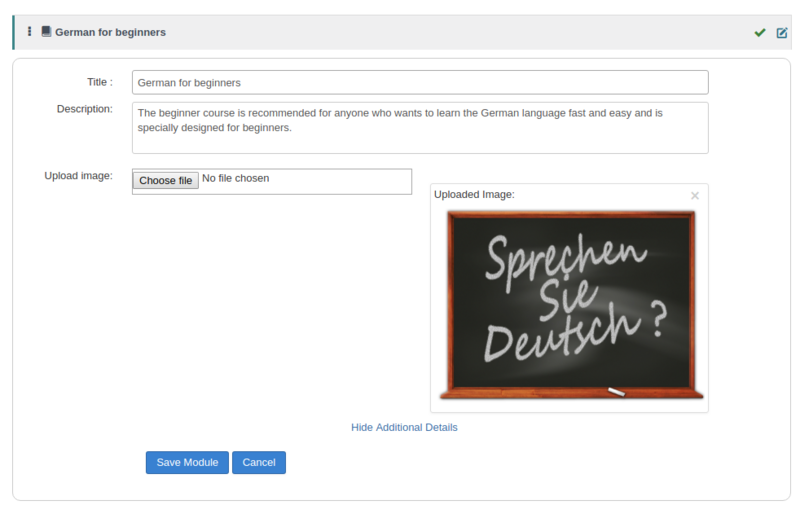 Categories can be used to organise your courses and make them easier to find for your LMS users. You can either make a single level category structure or choose to do nested categorisation depending on the kind of content you have. Sometimes a strict hierarchical structure can be restricting to your organisation needs. A tag based organisation can give you a lot of additional flexibility to manage and display your content. As your LMS grows in terms of content, finding content can get a little difficult with normal organisation based navigation. Search is the best way to find the content you want. Shika extends Joomla Search with a search plugin to let your users quickly find the content they want. With Alias for Courses and Lessons they’re going to be more Search Engine Friendly. Modules are used to club together a set of lessons and quizzes together. This allows for better intra course organization and better presentation. With the release of Shika 1.1.11, modules are collapsed by default for the courses in the frontend. Courses can contain lots of modules and they in turn can have lots of lessons and quizzes. Our drag and drop course management tool make it easy to rearrange your content as per your needs. In some cases its necessary to enforce a certain flow in which a user can access a lesson. The order in which you want the user to go through the lessons in the course is called a Learning path. Learning paths are created by setting eligibility criteria against a lesson. You can set one more more lessons as the eligibility criteria to access a lesson. You can support lessons by giving additional study material or notes using the associated files feature. Multiple files can be made available against each lesson and are offered to the course with the lesson. Whether you are deploying a LMS in a large organisation or you want to restrict access for your specific workflows, ACL can be a great help. 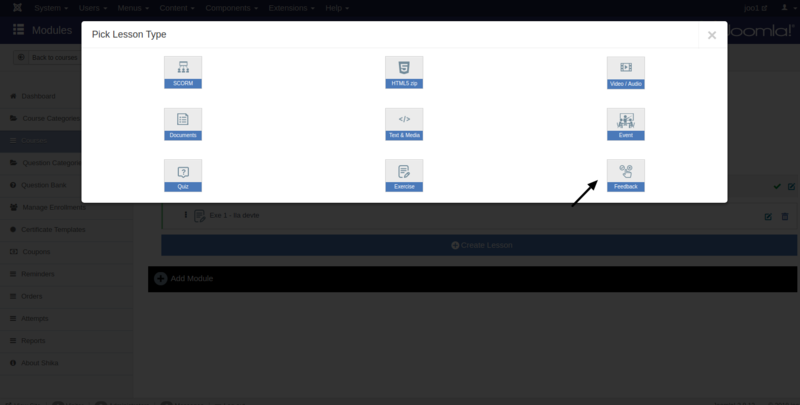 Joomla ACL support for courses lets you simple as well as complex ACL scenarios to restrict or allow access as required. 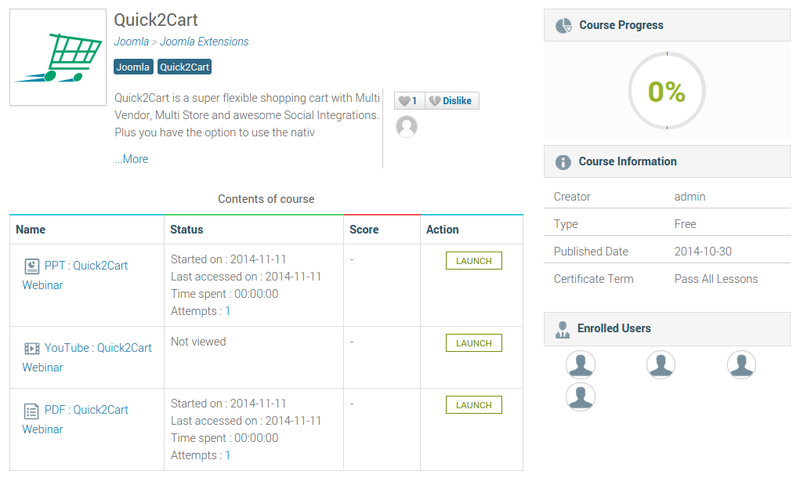 A module that displays the list of courses, total number of enrolled users, start date and type for the courses. One can create a menu item for a single course, from backend menu manager. Time spent column on pop-up view of attempts displays the time taken to complete the course for that attempt. The Courses menu now offers new filtering options. Now you can choose to display courses from all or a specific category and also choose All, liked, recommended and enrolled courses. The Layouts offered also have expanded configuration and you can choose number of courses to show in pin layouts based on device size. This tool offers the standard Joomla WYSIWYG as a course authoring tool. Simple flexibility to create any kind of content you need with the option to switch to hand coding html if you need to. This tool is offered with the view of making content authoring drag and drop easy ! With a beautiful UI and lots of ready to use elements like drop in headers, footers, body content styles, google maps videos and much more, this is the fastest way to author content that looks polished and complete. SCORM is a set of technical standards for e-learning. It brings standardisation due to which you can use a course created using any popular SCORM authoring tool with Shika. 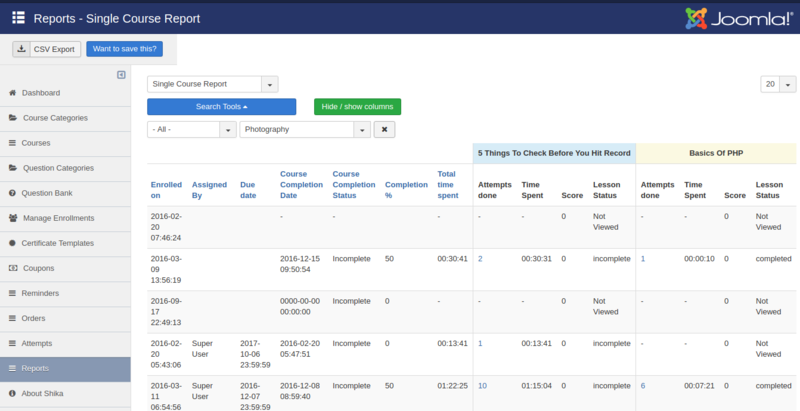 Shika tracks completion, scoring and all critical parameters monitored in SCORM. 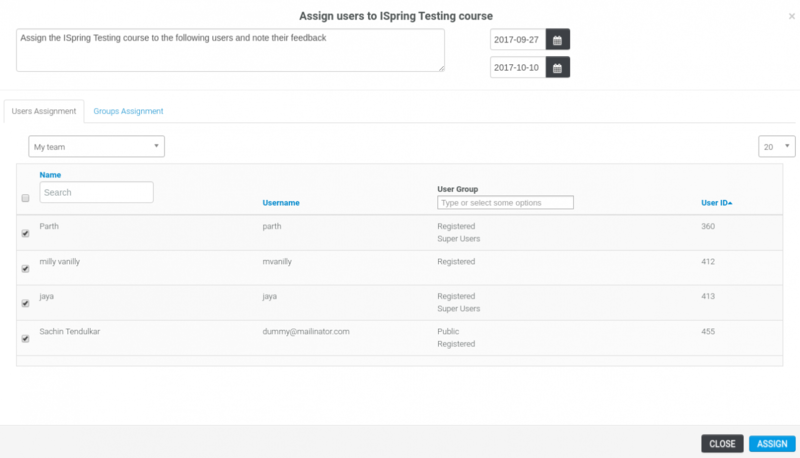 Shika supports SCORM authored content using iSpring. Authoring learning content is one of the biggest challenges teachers face. The simplest way of authoring courses are traditional tools like Word, Powerpoint and PDFs. We have created an awesome lesson player by integrating the Box API which makes learning using these traditional document formats - PPT, PPTX, DOC, DOCX as well as PDF a breeze. With Shika 1.1.13, we have updated Box API integration useful for rendering document type lessons. Another comparatively easy authoring language for teachers is HTML. HTML content can be created by a variety of desktop as well as web based applications. To make it even easier we offer HTML Authoring tools in Shika which can make authoring HTML courses lots of fun ! Video learning is one of the easiest ways to produce content with great software available to do screen recordings, voice overs or direct video recording. Plus learning with audio visuals is much more engaging than static content and is thus much more effective. Shika offers multiple flexible options for video learning. You can choose to upload your own videos or embed videos from Vimeo or Youtube. In some cases, learning can be simply about plugging in headphones and listening to audio content. Again pretty simple to produce, teachers can record the audio content and upload the mp3. HTML5 lessons can contain rich interactive content and even games. This will typically need you get content developed from a HTML5 developer. To make HTML5 content work in Shika, you just need to ensure that your content has an entry file named index.html and the file and course assets are packaged in a Zip Archive. We also offer our own tracking API if you want tracking for your non SCORM HTML5 content. LTI or learning tools interoperability allows for adding content from external learning content providers who support the LTI standard into the LMS. This is introduced as a new Lesson type called 'External Tool'. Typically Learning management systems are associated with 'On Demand' learning. With 'Event as a lesson' support with JTicketing we introduce the ability to add 'Scheduled Training's' into your Shika courses. This is just a start to the various 'blended learning' combinations that you will be able to achieve with Shika in the future. Since JTicketing now supports online training now with Adobe Connect integration, these 'Events' can be online or offline ! Link as lesson allows you to compile information from the internet and set it in the right context. You can use links from any site that allows iframe embedding. A lot of our customers wanted to re purpose Joomla articles for their learning content and also get benefits of using the plethora of 'Content plugins' available for Joomla for creating content. Joomla webmasters thus need to have no new learning curve to create learning content now ! Just like HTML lessons, we track time spent on these lessons too ! 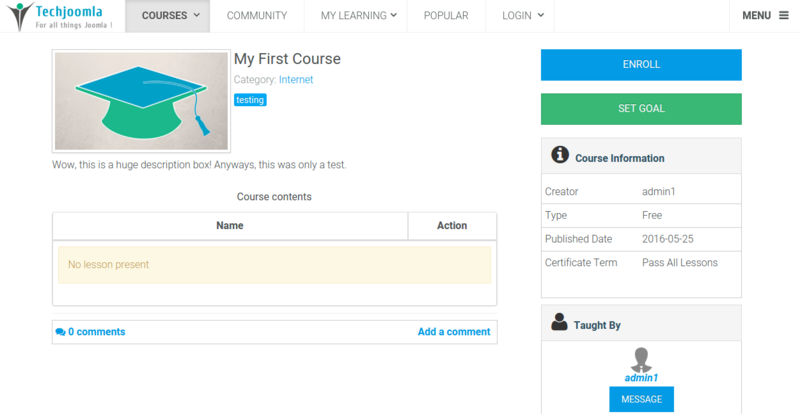 .Course creators can get feedback from their students in a comprehensive manner. Shika lets you maintain a Question bank of questions that you can use to create your Quizzes. Any new questions you create are automatically added to the question bank for reuse later. Shika supports creating questions with multiple choices as answers with multiple correct answer support. Shika lets you curate Quizzes by using Questions from the question bank or create questions on the fly. 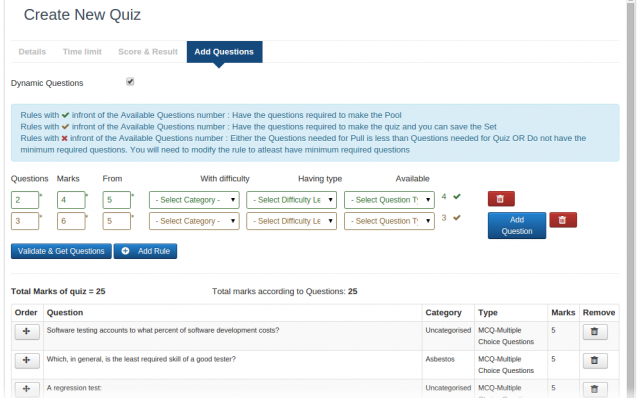 Alternatively you can use the intuitive rule based quiz generation tool to generate a quiz and then modify it as needed. While creating a question for the quiz you have to provide the correct answer for that questions. Based on this the quiz is automatically checked and the results are generated and stored. 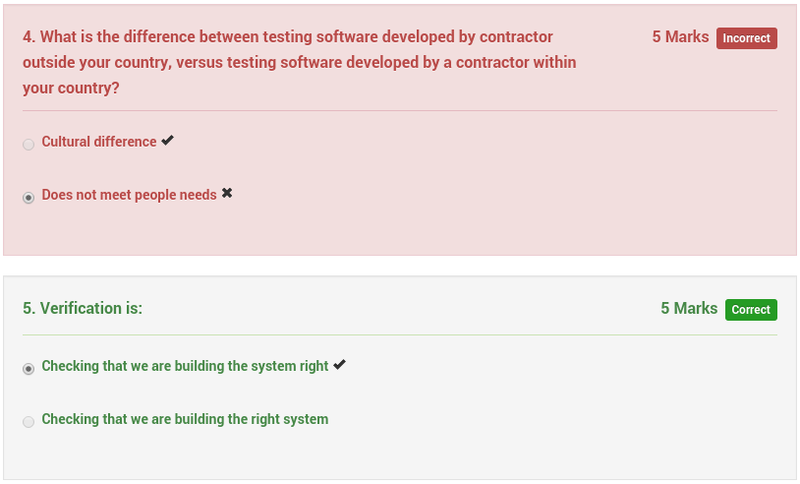 Optionally show the answer sheet to the user after he or she completes the Quiz to aid their learning. If someone has attempted a quiz and left it incomplete, they can continue the quiz from where it was left off. This can be done for quizzes where they are used to aid learning. For serious exams, it should be turned off. You can delete questions from the Question Bank. However if the question is associated to any of the quizzes it will not be deleted and an error message will be displayed. While creating a question admin can now add a comment against the answer which will be shown while the quiz is been reviewed after the completion. 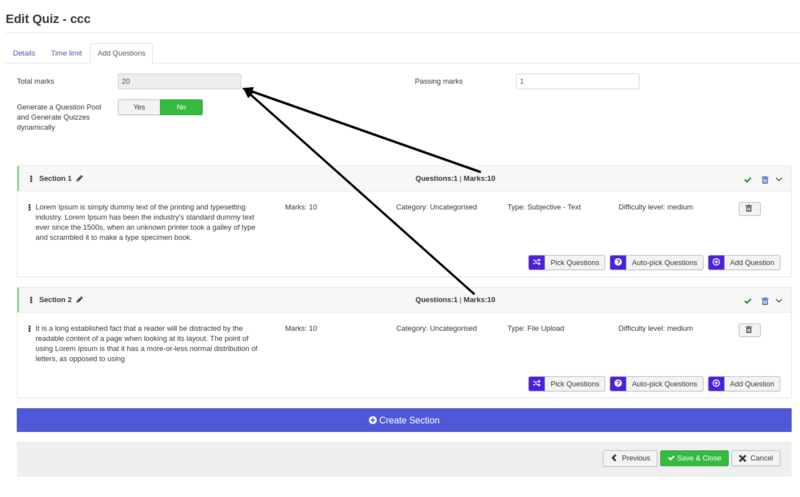 With this feature, its possible to define a Master Pool of questions from which a random quiz is generated for each student. This will randomly shuffle the order of rendering of questions as well as the order of answer options as per the configuration. 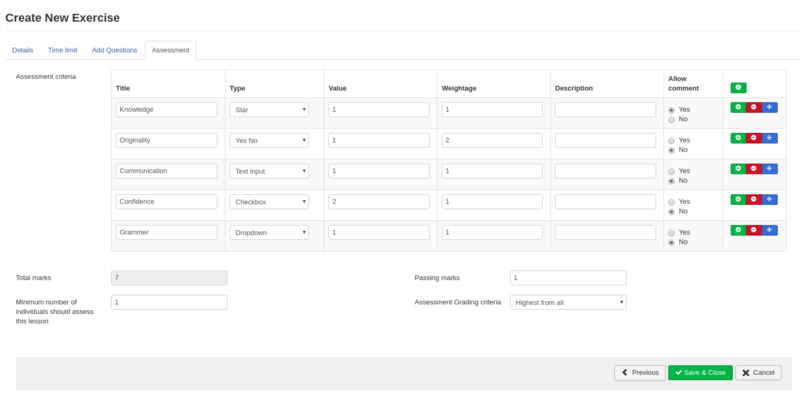 Shika 1.3 introduces the brand new assessment feature for exercises and quiz. 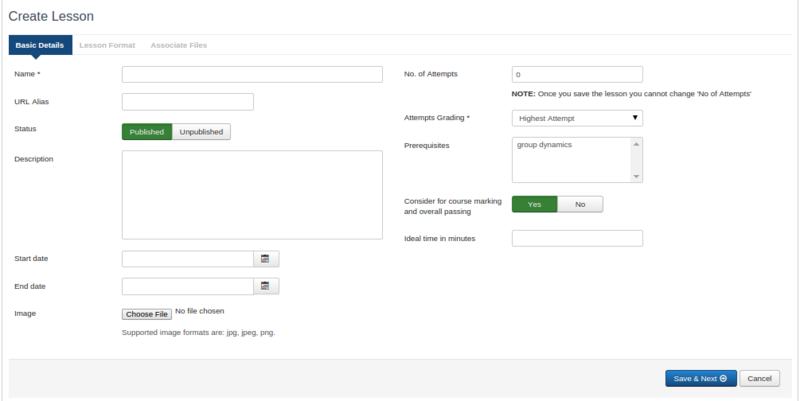 Course creators can assess the users based on 5 parameters-Star, Yes/No, Text Input, Checkbox and DropDown. Assessors can enter the marks to be alloted to every parameter. 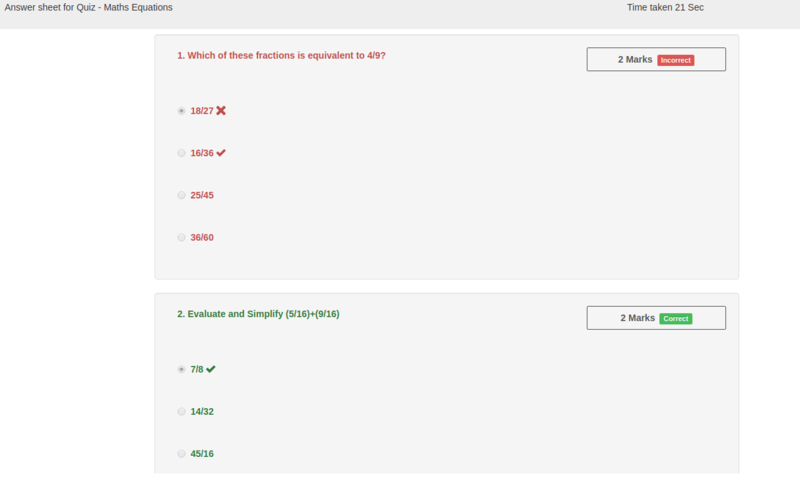 Shika 1.3 introduces support for sections for grouping the various questions in a quiz. With Shika 1.3.6, site administrators can now add the media type of their choice to both question as well as question options while question creation. 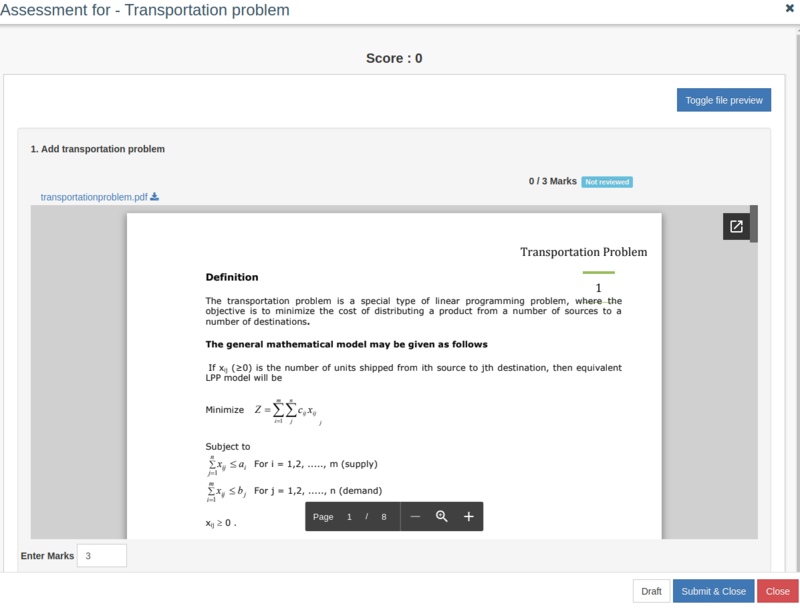 Course creators can set Maxlength and Minlength for the answer text. Note that the Minlength should be greater than or equal to Maxlength. Assessors can also preview files uploaded for file upload question type for exercise and quiz during assessment using Google Viewer or Microsoft viewer. Time spent on learning is an important assessment parameter in many countries. Shika tracks the time spent down to the second for all types of lessons. Traditionally this was seen as a feature only available to SCORM courses, but Shika has made it available to all kinds of lessons. Ideal time for lesson can be set from the backend to assign the ideal time in which a particular lesson/course is supposed to be completed. You can choose how to calculate the score of a lesson across multiple attempts. You can choose if you want to use the best score, average or the latest attempt score among others. When you create a course, you can set the certification criteria. Only when these are met, a certificate for the course shall be awarded. You can choose from Pass all lessons, Complete all lessons or No Certificate. In addition you can choose on a lesson level if that should be considered for passing. You can certify your course by providing a certificate to the student. The certificate template can be designed in the backend using the template editor and replacement tags available. Now create multiple certificate templates and choose which template you want to use when you create a new Course. 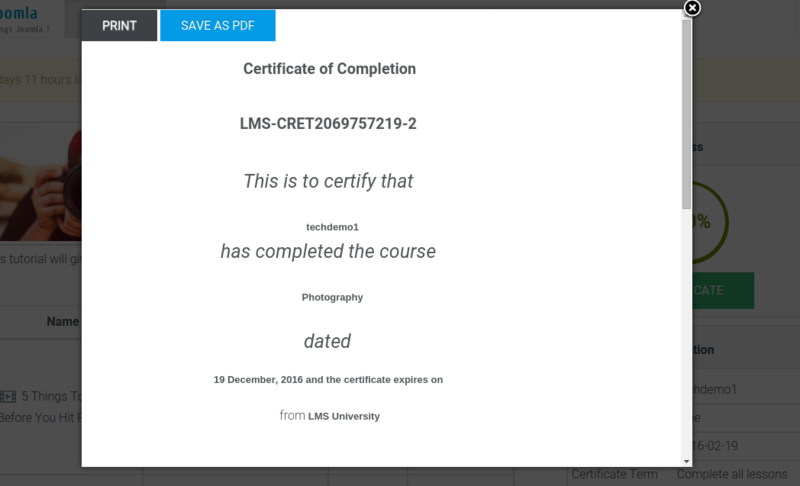 With Shika 1.1.9, you can select the orientation for the course certificate template-portrait or landscape. With this feature every certificate that is awarded via your LMS gets a unique ID which makes it easy to track authenticity. 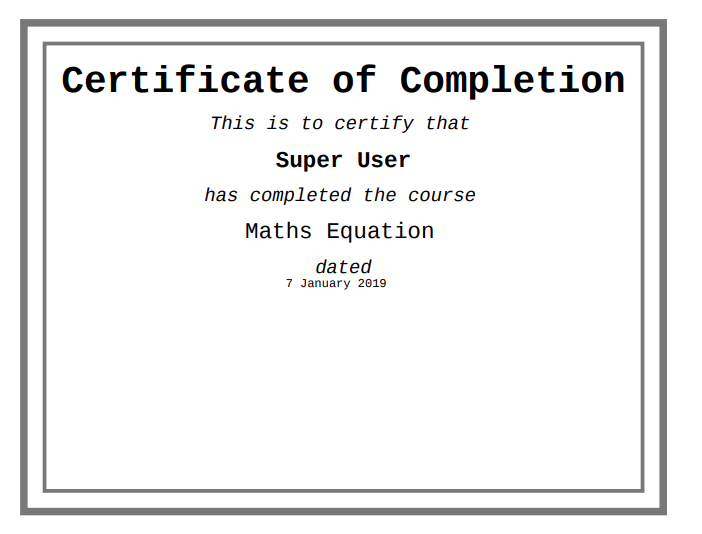 When creating a course you can now also set a certificate expiry after which the certificate becomes invalid. 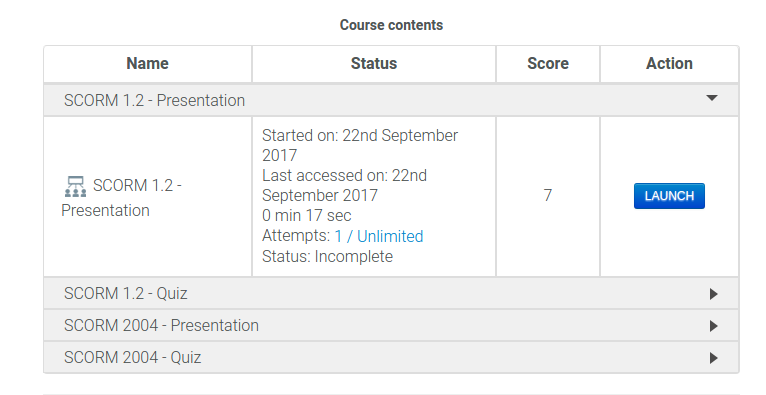 Both this and unique certificate id feature are extremely useful if you are doing CPD (Certified Professional Development) type courses which expire after a certain period. 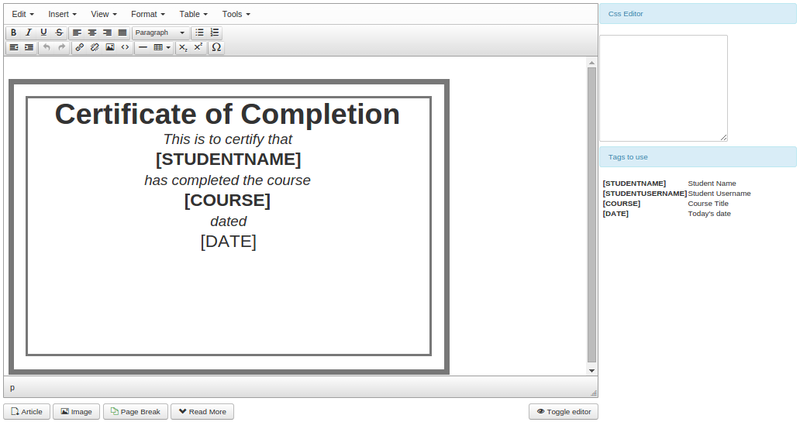 Lets you output the 'time spent' by the user in the course as a replacement variable in the course certificate. Personalize your certificate by using select EasySocial and JomSocial fields in your certificate template. Shika 1.3.3 allows you to create great looking certificates by experimenting with different page fonts and different page sizes. With Shika 1.3.8, course creators can add custom fields to the certificate template in addition to some pre-existing tags. 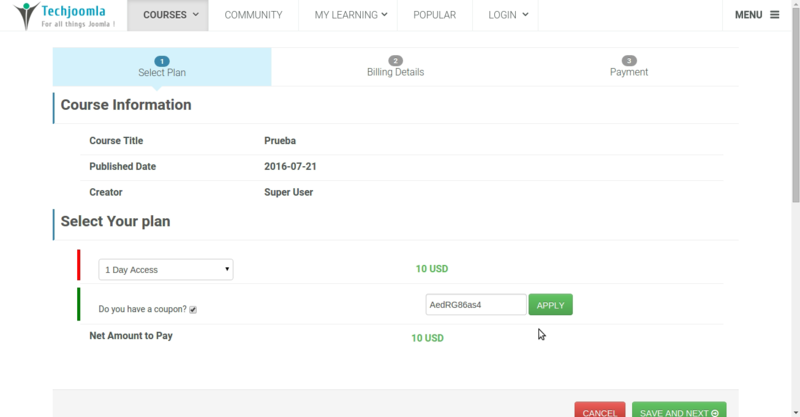 Shika lets you sell access to your courses. You can choose to set course access subscriptions in terms of Days, Weeks, Months or Years and set pricing accordingly. You can have multiple duration and pricing options for your courses. 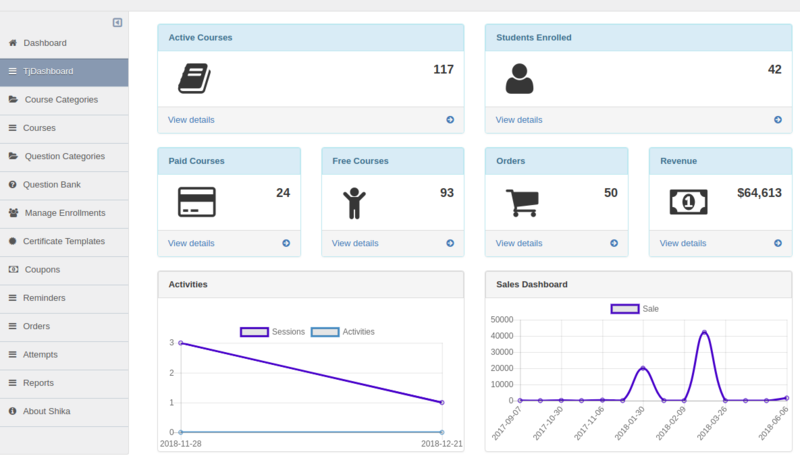 The Ecommerce Dashboard shows you a quick overview how your course sales are doing with a quick revenue display as well as a monthly sales graph. Our extensions are powered by the 'Joomla Common Payments API'. Your Subscription comes with free support and updates for the following plugins. Free samples are the best way to let your users try your course content hands on ! You can set one or more lessons as free samples in a paid course. Now its possible for users to renew expired subscriptions . Easy to manage enrollments and assignments along with the respective start date and due date along with user notification. CSV format has been changed for appending the users to the multiple user groups with Shika 1.1.11. Now easily find which coupons are working better for you with a 'Use Count' display which shows how frequently a coupon has been used in the system. This allows you to now create coupons that are specific to a course. It also lays the foundation for 'Vendor specific coupons' that will come in later versions when we bring multi vendor support. Shika allows you to easily integrate Facebook, Google+, Twitter like and share buttons on your course pages. Shika comes inbuilt with simple activity stream system that records and shows all the users learning activities in an intuitive way. This can be open organisation wide to let people see the learning activities of their peers and drive learning via peer interaction. 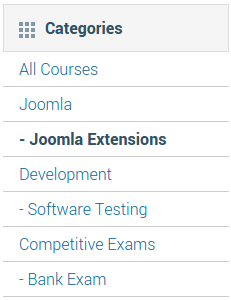 Course recommendations can be given by any users on the system to his friends or any user on the Joomla website. Depending on whether you are using plain Joomla or a Social networking extension, this allows recommending courses to anyone of the site or just your Friends. Recommended courses is a great way to drive learning in a Social way. This feature is available if you have integrated with JomSocial or EasySocial. Groups are a place where all the course students can interact with each other and their teachers. Groups provide features like discussions , media sharing and more to bring a great ‘co learning’ experience. Shika integrates on various levels with popular Social networking systems like JomSocial and EasySocial. Integrations for other networks like Community Builder, JomWall, Gravatar will come in later releases. Shika uses the Avatars and links to profiles of the respective Social network that the Social integration is activated with in the backend configuration. Showing avatars of users or friends of the student across the front end interface adds a feeling of familiarity and friendliness and also drives content discovery by the end user. Shika comes with its own elementary learning activity stream however if you are integrating a Social network of your own, then we support pushing activities into the supported Social Stream of the user. This adds vitality to learning in the network by promoting content discovery and peer interaction on learning content and achievements. Rewards are a great way to promote learning. Points integration will let you do this easily. Shika supports integration with JomSocial as well as EasySocial points systems and the admin can configure the respective rules to define how the integration will work. With Shika 1.1.12, we have provided feature support for AltaUserPoints. 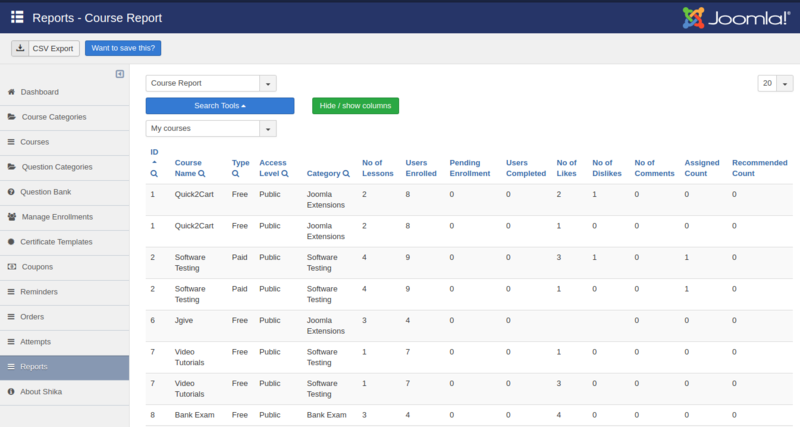 Users will be allocated points based on each course enrollment and on completion of each lesson attempt. It feels great to show off an achievement and get recognition for it. It also serves as a great learning driver for not only the person who achieved something but also to their peers. Shika integrates with EasySocial Badges and these can be awarded using the same criteria for certification. If you select a EasySocial badge to be awarded against a course, then the badge is awarded automatically when the certification criteria are met. The Learning toolbar is available when you launch any lesson. It provides easy access to various learning and social tools in a quick and intuitive way. Users are given a slick interface to take notes while they are viewing a lesson. Part of the Learning toolbar, its very easy to access your notes and do that without interrupting your lesson. Lists are a easy way to organise lessons across the system in a way that makes it easy for the student to find. Think of them as Gmail Labels. Each student can create their own and add any lesson to one or more lists. Every student has their own learning dashboard that gives a quick view of their learning activities, recommendations and activity charts to the user. 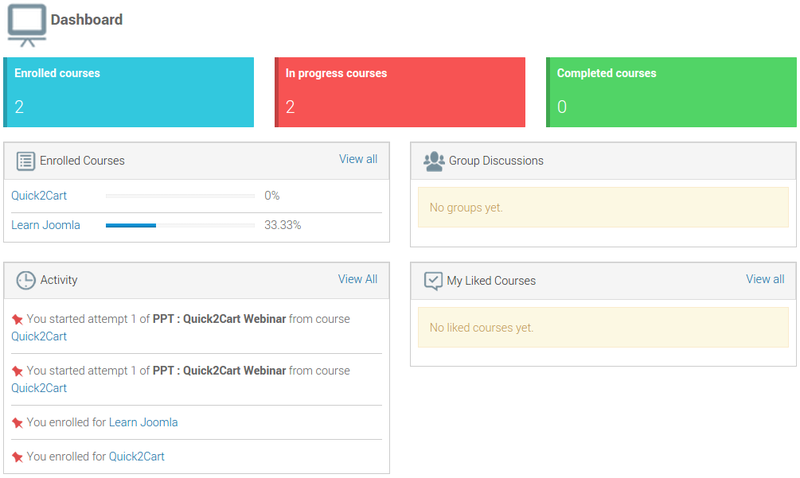 The Dashboard quickly shows the user their Enrolled courses, progress across courses, activity stream and graphs, group discussions etc in one quick view. It is possible to add more rich and useful widgets and content to the dashboard using Dashboard plugins. It opens up a new opportunity for 3rd party developers to join the Joomla learning revolution we are starting with Shika and contribute some snazzy Dash plugins. Dashboard widget for total ideal time denotes the total time that is to be allocated to each lesson and for comparing with the actual time spent for each lesson which helps time tracking. 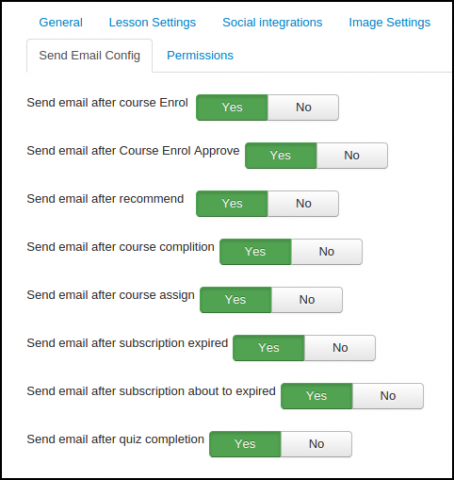 Teachers and admins can assign users to one or more courses in the system using this feature. Assignment indicates that its mandatory for the user to take that course. In a corporate environment you want to be able to assign courses to students and have them complete them in a specific time frame. 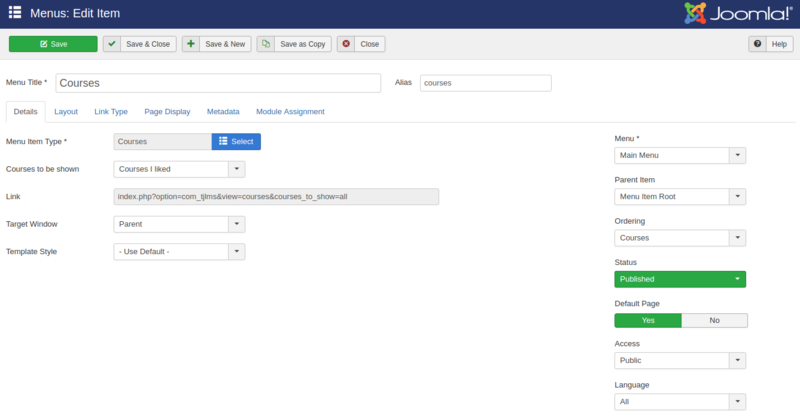 With course assignments, admins and course owners can assign courses to students and set start and due dates. Students can also set courses as 'Goals' with due dates for themselves. This is powered by jLike transparently in Shika and is an excellent example of the seamless integration goals we have set for integrating products with each other. This comes with an improved back end enrollments view with better filters. We are also shipping an Alpha of 'jLike based reminders' with this release which you can try in jLike. 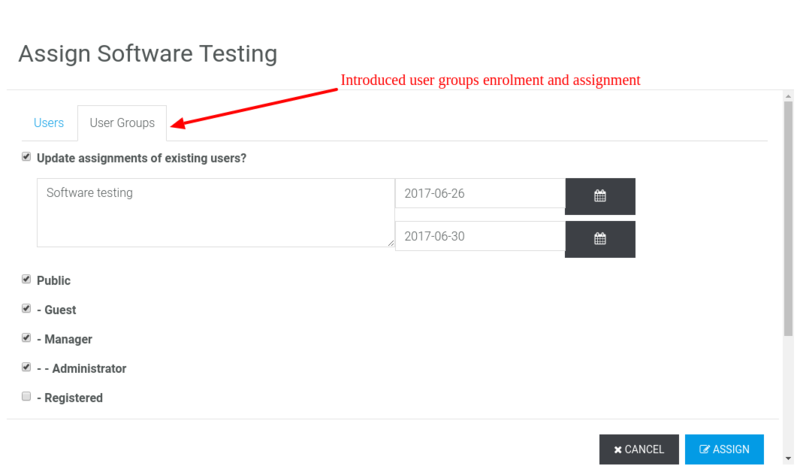 Assign function lets you easily assign a course to all users in a User group using the Assign by Group function. Shika 1.1.5 brings assignment reminders. Setup multiple reminders to remind users of their assignment due dates. 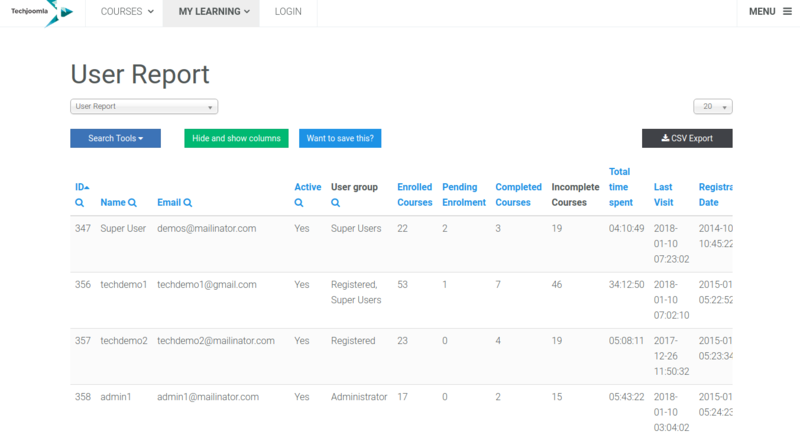 The course report helps teachers and admins get a quick overview on a course level. Which includes details of people enrolled for the course, people who have completed and who have not. So the teachers can keep a track of their course. Students report card gives a student level performance report across courses. It contains the number of attempts taken per lesson, score and status. This reports gives you insights of all the Attempts made by the students. This report covers extensive details about the lessons. 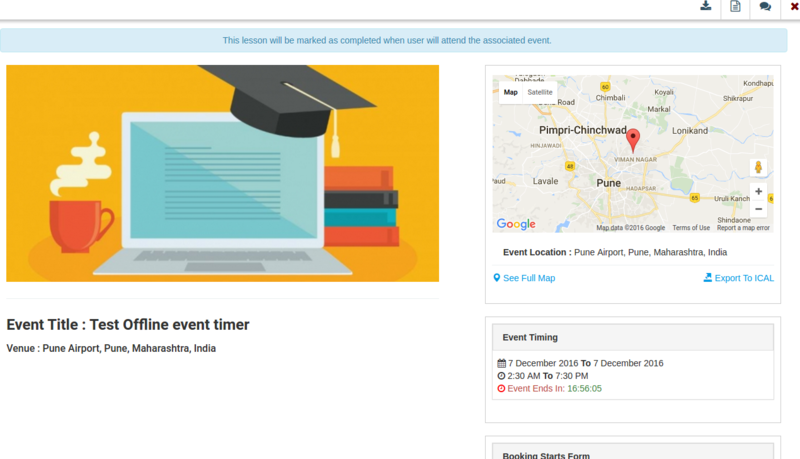 Like start date, end date, attempt, status, time spent and more..
Get all the insights of the user from details like number of courses he has enrolled in, contact details, pending and completed courses etc. This awesome Reporting tool gives you control on what you want to see in reports, set filters and also choose what columns to show and hide. You can also save your own custom reports. Admin can set the Date format to be used for reports and other areas. 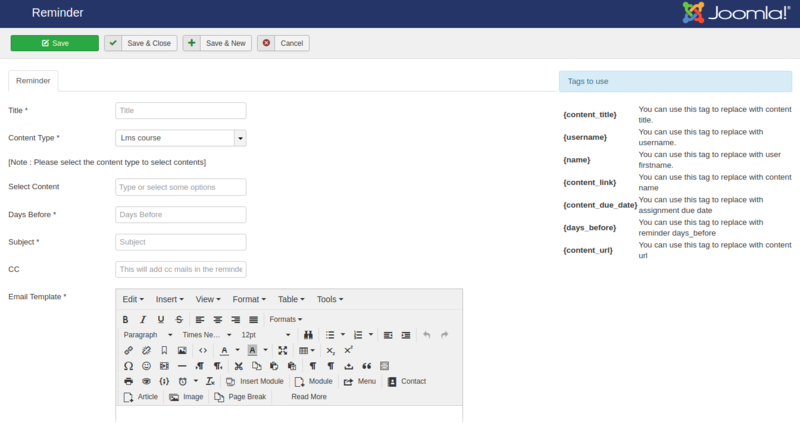 Now filter the user report using Joomla user groups. 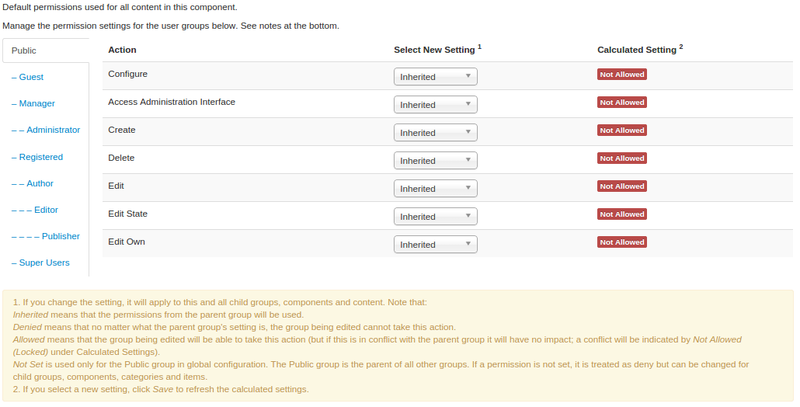 Very useful if you are using Joomla groups to setup departments in a company. You can choose between a blog view, a Pinterest like variable height view and also a fixed height pin view to show your courses. You can choose to create a menu common for all categories or have category specific menus. Shika is completely responsive and brings an awesome learning experience to you whether you are using a desktop, laptop, tablet or a mobile device. 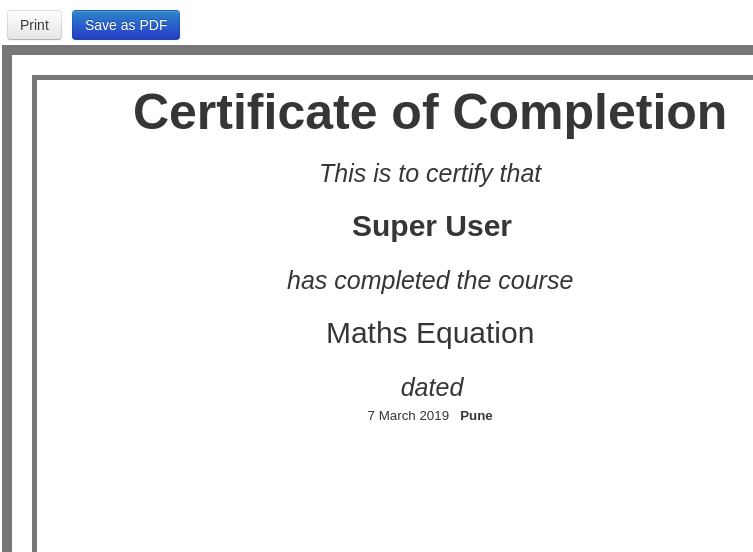 The Course page gives a quick look at what the contents are all about and also shows you your progress and other user specific course metrics if you are logged in. 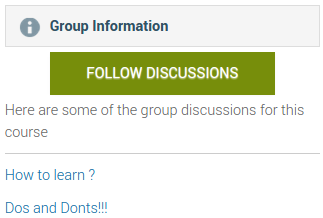 A Table of contents, your progress and attempts on each lesson, overall course progress, Social information like group discussions, group chat and other members enrolled in the course is shown in a nice intuitive interface. Easily override the user interface of Shika without changing the core files. Vast improvements to the UI for the windows/tabs used for assigning and enrolling users to the courses. Elearning assets can be pretty heavy and having a cost efficient way of storage is supercritical for a Learning management system. Shika offers inbuilt Amazon S3 integration to let you store all learning assets in a cost efficient way. We use native Joomla MVC throughout the public views of Shika. This means you can use Joomla template overrides to easily override the output and give Shika your own custom look. TINCAN relies on using a Learning Record Store to store all learning metrics. 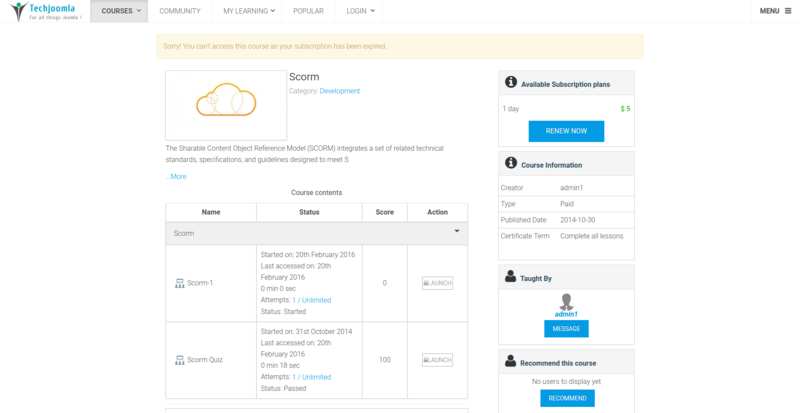 Currently Shika ships with SCORM Cloud Public LRS plugin integrated. The LRS plugin API allows you to add your own LRS integrations to Shika. Keep a watch on all important things like total number of courses, students enrolled, pending enrollments, revenue and much more. Detail analysis of these things with activity and sales graph with the e commerce dashboards and reports. Shika uses Techjoomla’s common payments API to power its payments. You can develop additional payment plugins for Shika and other supported products using the Common Payments API. Your Subscription comes with free support and updates for the following plugins.